« World’s friendliest city? Who are you going to believe? In the rush to produce infographics, there is a risk of focusing more on the clarity of the message at the cost of transparency of evidence. Without in any way wanting to raise questions about the value of reproductive health and rights programs, I found this infographic less than satisfactory- because the findings have been oversimplified to the point where they have lost credibility. “Each year of education results in a 10% increase in women’s earnings.” Not likely. Isn’t it more likely that some years would be of more value than others – especially those that relate to years where basic literacy is achieved, or school graduation completed? Isn’t it more likely that this would apply for some women in some countries in some occupations? For highly educated but unemployed young European women, another year of formal education might not make much difference at all. And isn’t it more likely that this statistic comes from a single regression line from a single study that is being inappropriately extrapolated? Hard to do more than speculate because the infographic has no link to the source for this and other reported findings – which is a shame, because the statements which apportion causality suggest some very interesting methodology has been used. 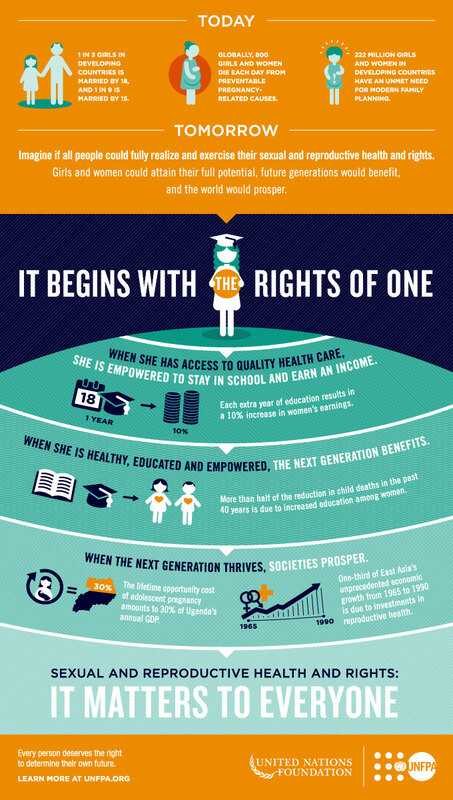 Instead the infographic refers simply to the UNFPA.ORG site where, try as I might, I’ve been unable to find the sources for the infographic. More information about the studies behind the infographic would be very welcome!